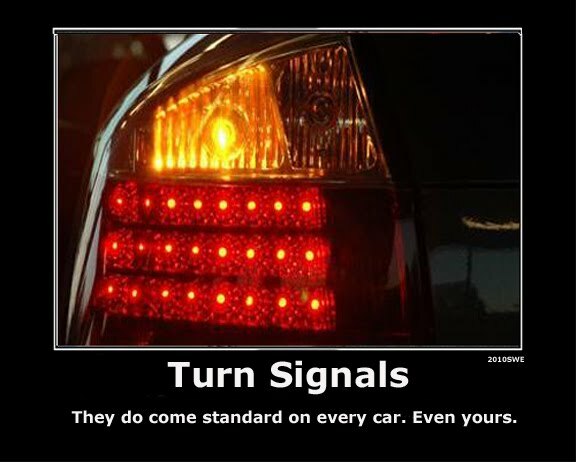 My biggest pet peeve on the road is when drivers don’t use a turn signal. My not-so-best side pops out when a driver swerves into my lane unannounced and I’m forced to slam on my brakes in order to graciously let them drive ahead of me. And I grumble at the driver who brakes as if a danger is ahead but is really making a left into the supermarket or a right into the slow lane. I swear I’m not an angry person. What annoys me is the lack of consideration. Are reckless drivers so engrossed in their own road trip that other cars don’t matter? Do reckless drivers think that the drivers around them intuitively know their journey and should anticipate their next move? Is traffic courtesy too much to ask? After one of these aggravating instances (and being fueled by caffeine), I realized that this also annoys me as a reader. I can’t stand it when a writer doesn’t use a turn signal. So, what is a turn signal in a story? It’s when the writer gives you hints about what’s coming next, foreshadowing clues through character descriptions, dialogue and actions. Usually these clues are subtle so that the reader intuitively goes with the ebb and flow of the story without overthinking the story arc. Don’t get me wrong. I love the element of surprise in a good book. What I want to see though when I flip back through the story are the breadcrumbs the writer was dropping all along—that I didn’t consciously notice. When a writer doesn’t use a turn signal, the reader doesn’t trust the writer. Why did the writer hide the full truth from me? How can I sympathize with this character with so many inconsistencies? Why should I continue reading if the writer keeps jerking the story around? Sometimes not using a turn signal is an accident. The writer thinks that the clues have been planted when there’s not a drop of evidence within the story. This usually happens when the driver—I mean, writer—is so engrossed in the story that they think all necessary details are on the page. This is where the editing phase plays a key role. Reread your story like a reader. Are all your clues in place? Is the should’ve-saw-that-coming factor locked in your story? And never make assumptions that your reader knows where you’re going. How are you using a turn signal in your current writing project? Share your expertise below. One of New York’s Finest did that to me recently. Almost ran me into the sidewalk by cutting me off without any warning, lights, or otherwise indicator that he just had to occupy the spot I was occupying. I honked at him and he looked at me like, “How dare you! I’m a cop!” I was like, If you’re in too much of a hurry to signal, you are in too much of a hurry to stop and give me threatening looks. I’ll need a beta reader to tell me if I’m jerking readers around. I enjoy stories that keep me guessing what’s going to happen next, but it’s hard to tell if you’re crossing the line when attempting it oneself.